We are specialized in fancy packages for Dry Fruits, Sweet, Cakes, Pastries, Chocolates, Gifting Boxes, Corporate Gifting Items and so on. Our unique style and prints of boxes has helped our customers to brand their products in India as well as in abroad. Feel free to contact us with any query you have about Sweet box designing and printing services. This is one of its kind double wall style box used for various sweets and chocolates, comes in four sizes of 4 Chocolates, 6 Chocolates, 12 Chocolates and 24 Chocolates. We specialize in providing a range of Sweet boxes, which are designed to store various sweets and confectioneries in their original shape, aroma and taste. These are also available in Matt finish with spot UV gloss effect. These boxes are available in 500 gm, 1 kg size and other sizes. Size Sizes From 100gm To 1 kg. 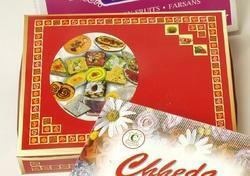 These bandhani design boxes are mostly used for Mix Sweets, that is these are used to keep assorted sweets. These boxes come in various sizes from 100gm to 1 kg. The design can be modified to place your logo besides the images. 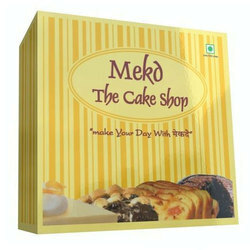 Cake boxes on both foil board and normal board are available in range of 320 gms upto 400 gsm. This box comes with an option of inside lamination as well. 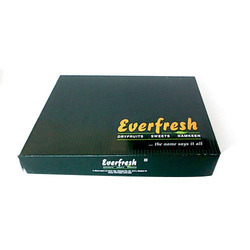 The size of the box can be customised for order above 5000 boxes. 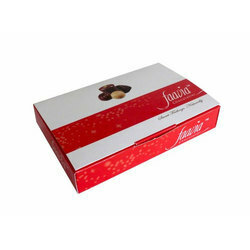 We are manufacturer and exporter of Sweet and Chocolate Boxes. We keep on developing many new designs for these boxes.We take care of end to end solution from Designing till Shipping boxes. 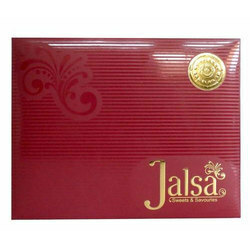 We are providing wide range of Laminated Sweet Boxes.This box is made using high quality FBB board. It is extensively acknowledged by the client for their strength, stiffness and superior quality. We assure quick turn-around time for the boxes to meet urgent client needs. Size 250 gm, 500 gm and 1 kg sizes. This is simple and elegant box, laying more emphasis on the brand image. This box comes with gold stamping. It is one piece box, so it reduces the shipping costs. 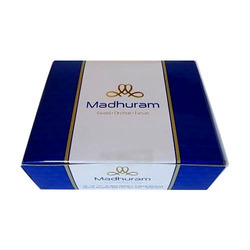 This box is available in 250 gm, 500 gm and 1 kg sizes.